Rainwater filter for larger roof areas. 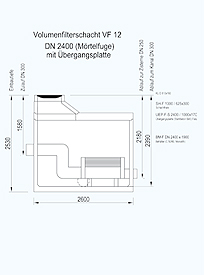 Filter for installation in concrete ring or other structural chamber (Ø 2000 or Ø 2500 mm). 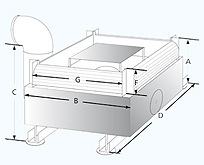 The filter can be delivered directly to site, or pre-fitted off-site. 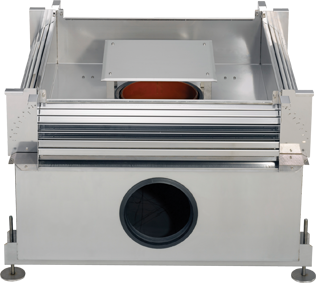 The proven 3P two-step Volume Filter cleaning system gives a high level of filtering efficiency, independent of flow rate. 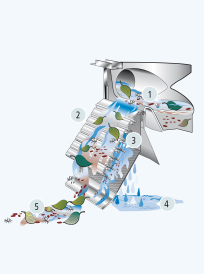 Due to the steep inclination of the two step filter cartridge, the filtered out debris is continuously washed away to sewer. The sewer outlet is installed within the chamber wall. The filtered out material falls to the base of the chamber and is washed away during the next intense rainfall event. 3933 m² roof area at rainfall intensity of 300 l/(sxha). A larger area can be connected using a bypass-installation. 18 l/sec = 64,8 m³ clean water per hour. Height difference between inlet and outlet: 600 mm, DN 300 KG elbows are supplied for mounting in concrete ring. The filter should be cleaned depending on the contamination loading 1 - 2 times during the year. As shown below with feeding-in and bypassinstallation. High security because of bypassinstallation, therefore larger roof areas can be connected.